One of the many arts and crafts I want to do more with is carving my own stamps and block prints. I just really like the feel of carving away at something and watching a design or shape slowly unfold. Unfortunately for my Mama, I discovered that love at the age of 3, using a nail file to dig swirls into the nice wood furniture.... oops! I found out that using the cheaper carving material is a little frustrating for smaller details. I'm sure for large designs its fine, but I did buy some nicer carving material for future work. 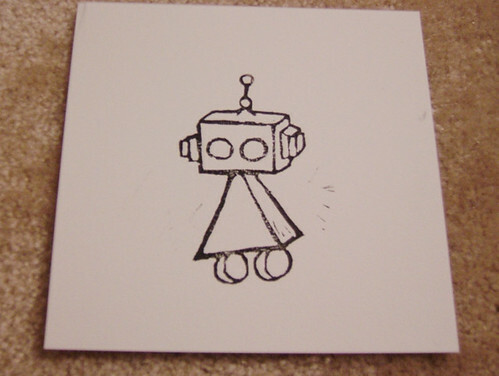 After finishing the carving, I did a test stamp of him onto a piece of bristol board using some regular stamp ink. I think he came out pretty good for my first try. 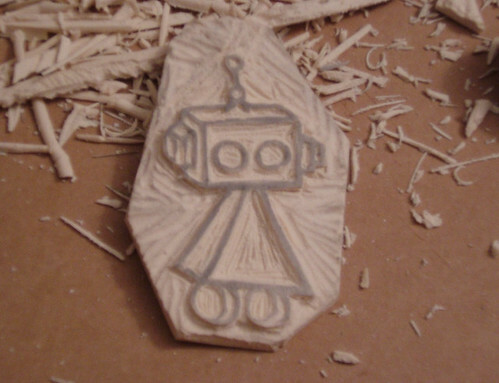 I have all sorts of designs in mind to carve. In fact, maybe I'll work on one over the weekend. . .
YOu should come over and witness the madness of painty-time again! I found paint with water books for the girls so they can play too without causing a huge mess!